I am very pleased to announce that all six sessions on J.R.R. 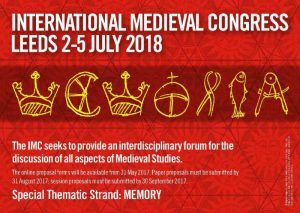 Tolkien I proposed for the International Medieval Congress at Leeds 2018 have been accepted! This will be the fourth consecutive year of papers on J.R.R. Tolkien at IMC Leeds, after a successful series of sessions in 2015, 2016 and 2017. Leeds is, of course, a Tolkien-related location, and it is very fitting that his work will be once again explored in this prestigious conference. Many thanks to Professor Thomas Honegger for his help with the IMC 2018 organizing. I am looking forward to a series of brilliant sessions and papers from well-established Tolkien scholars, alongside new voices and perspectives!